18 — 2 Irwin/Mc. Graw-Hill ©The Mc. Graw-Hill Companies, Inc. , 2000 Operations Management Refers to the management of the production system that transforms inputs into finished goods and services. 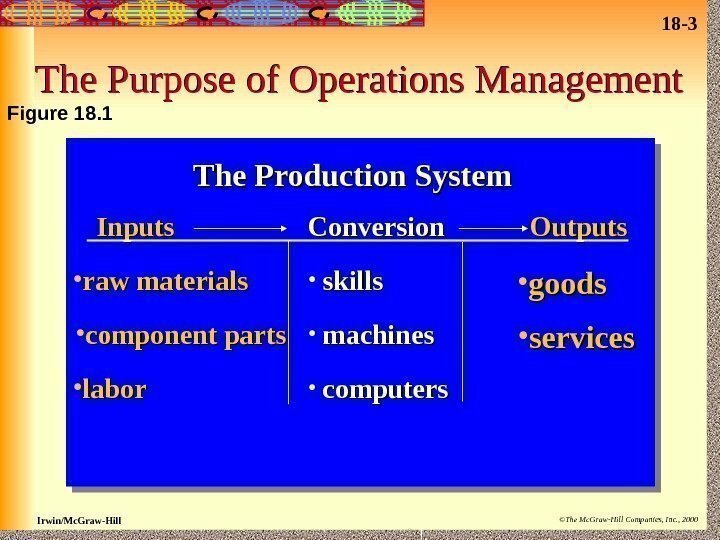 Production system: the way a firm acquires inputs then converts and disposes outputs. 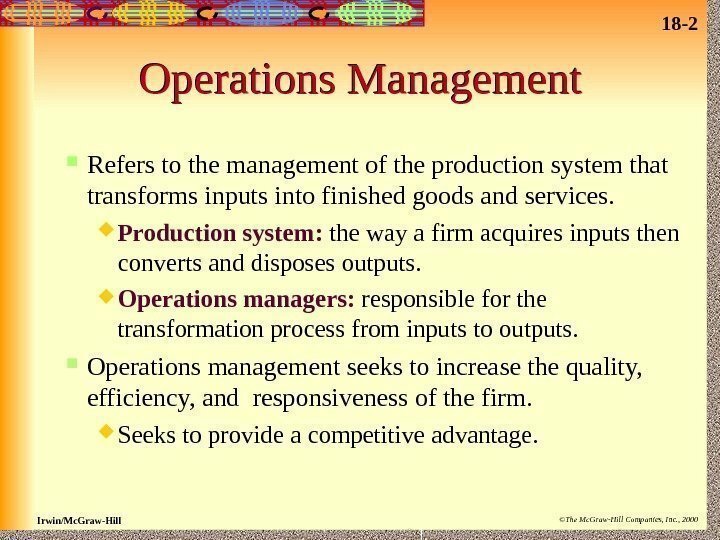 Operations managers: responsible for the transformation process from inputs to outputs. 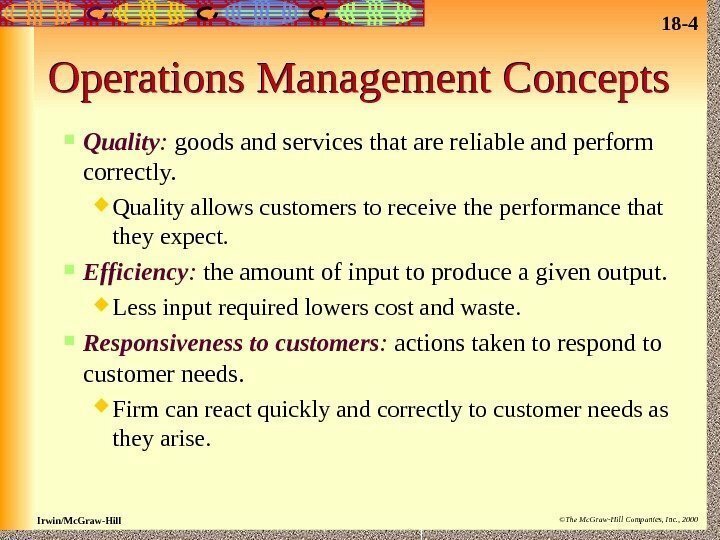 Operations management seeks to increase the quality, efficiency, and responsiveness of the firm. Seeks to provide a competitive advantage. 18 — 3 Irwin/Mc. Graw-Hill ©The Mc. Graw-Hill Companies, Inc. , 2000 The Purpose of Operations Management The Production System Inputs Conversion Outputs • raw materials • labor • component parts • skills • machines • computers • goods • services. Figure 18. 18 — 4 Irwin/Mc. Graw-Hill ©The Mc. 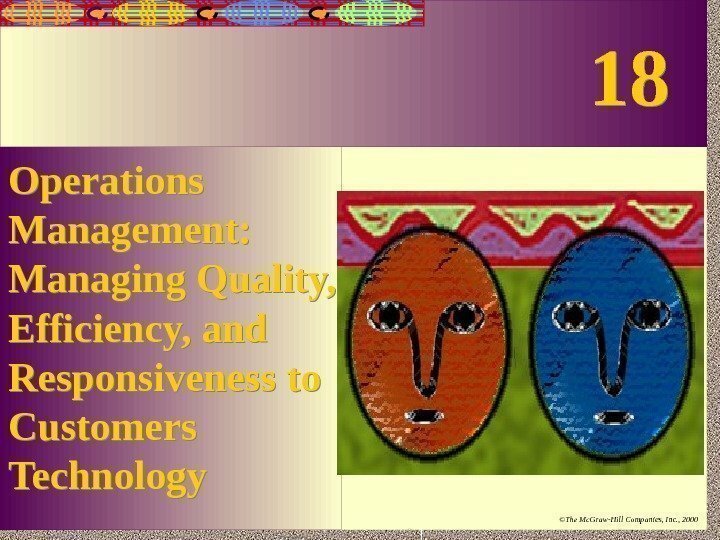 Graw-Hill Companies, Inc. , 2000 Operations Management Concepts Quality : goods and services that are reliable and perform correctly. Quality allows customers to receive the performance that they expect. 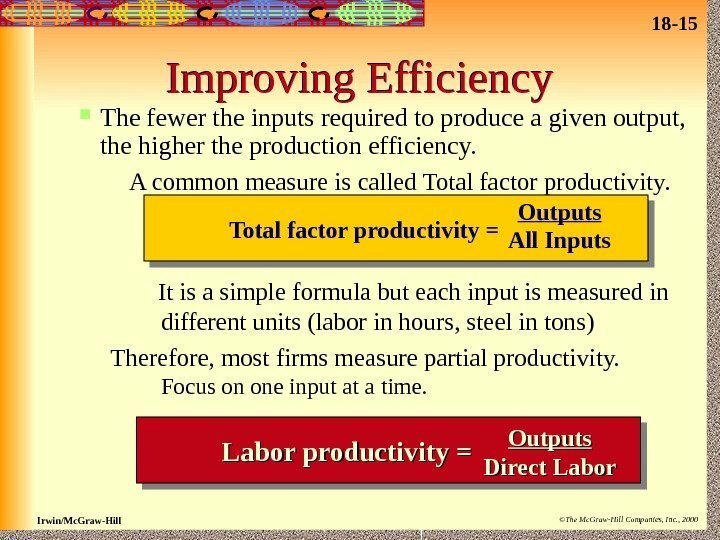 Efficiency : the amount of input to produce a given output. Less input required lowers cost and waste. 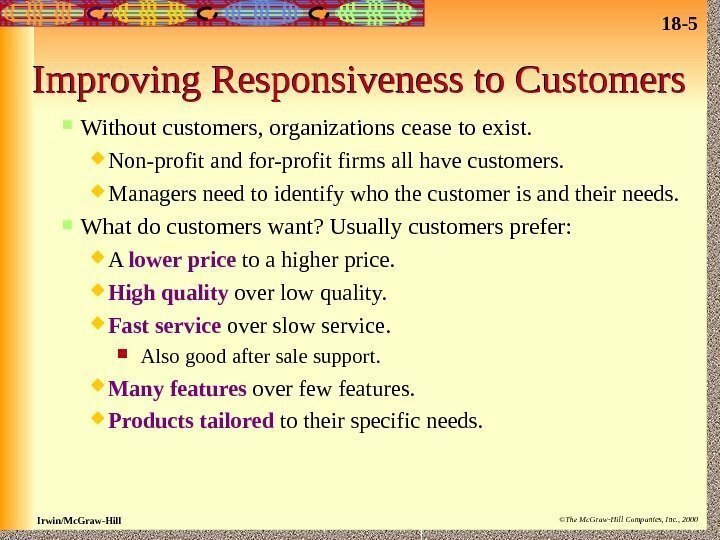 Responsiveness to customers : actions taken to respond to customer needs. Firm can react quickly and correctly to customer needs as they arise. 18 — 5 Irwin/Mc. Graw-Hill ©The Mc. Graw-Hill Companies, Inc. , 2000 Improving Responsiveness to Customers Without customers, organizations cease to exist. Non-profit and for-profit firms all have customers. Managers need to identify who the customer is and their needs. What do customers want? Usually customers prefer: A lower price to a higher price. High quality over low quality. Fast service over slow service. Also good after sale support. Many features over few features. Products tailored to their specific needs. 18 — 6 Irwin/Mc. Graw-Hill ©The Mc. Graw-Hill Companies, Inc. , 2000 Price/Attribute Relationship Attributes. 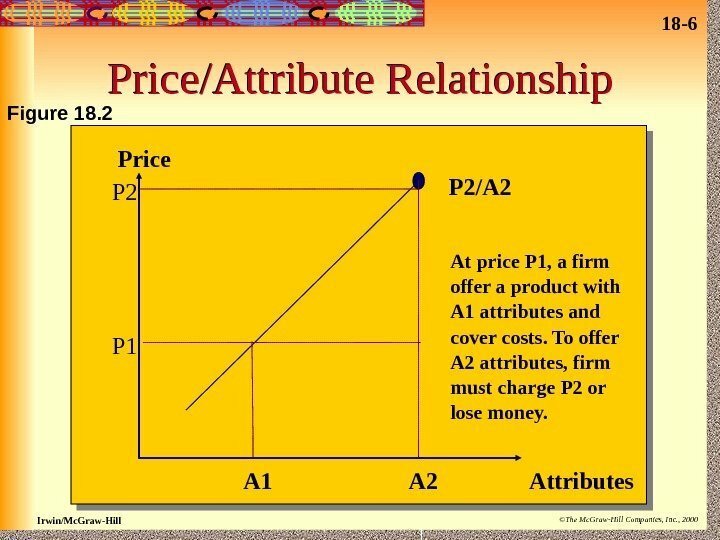 A 1 A 2 Price P 1 P 2 P 2/A 2 At price P 1, a firm offer a product with A 1 attributes and cover costs. To offer A 2 attributes, firm must charge P 2 or lose money. Figure 18. 18 — 7 Irwin/Mc. Graw-Hill ©The Mc. Graw-Hill Companies, Inc. , 2000 Price v. Attributes Firms offering high quality, fast service and other customer desires, often must raise price. 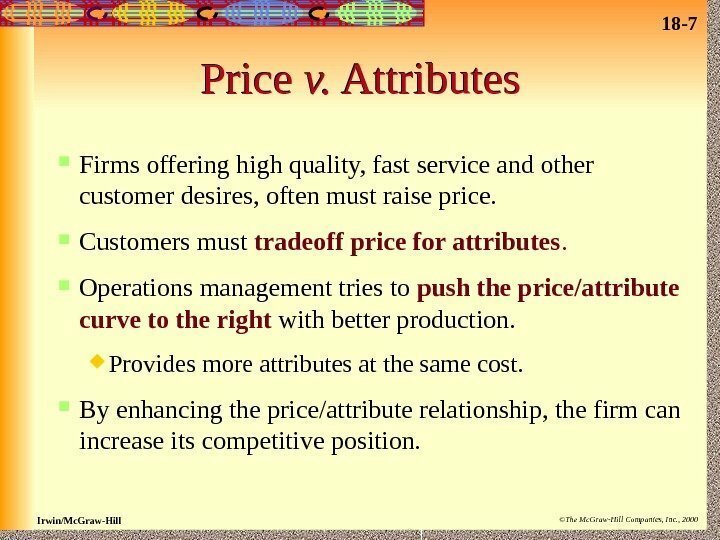 Customers must tradeoff price for attributes. 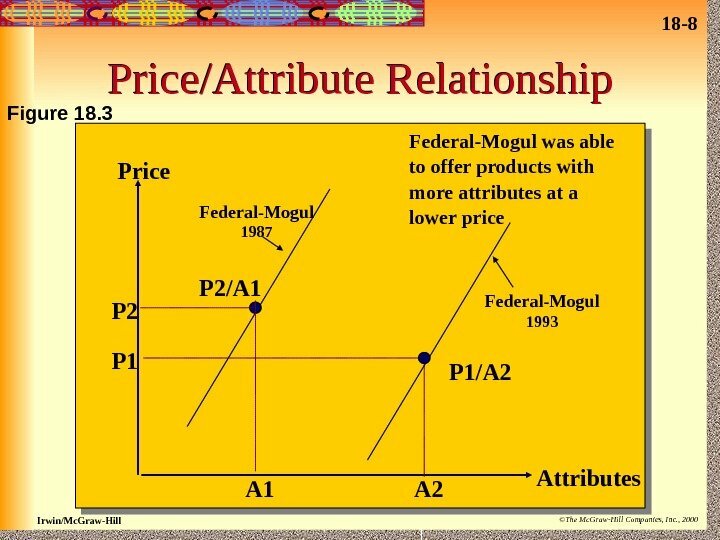 Operations management tries to push the price/attribute curve to the right with better production. Provides more attributes at the same cost. By enhancing the price/attribute relationship, the firm can increase its competitive position. 18 — 9 Irwin/Mc. Graw-Hill ©The Mc. 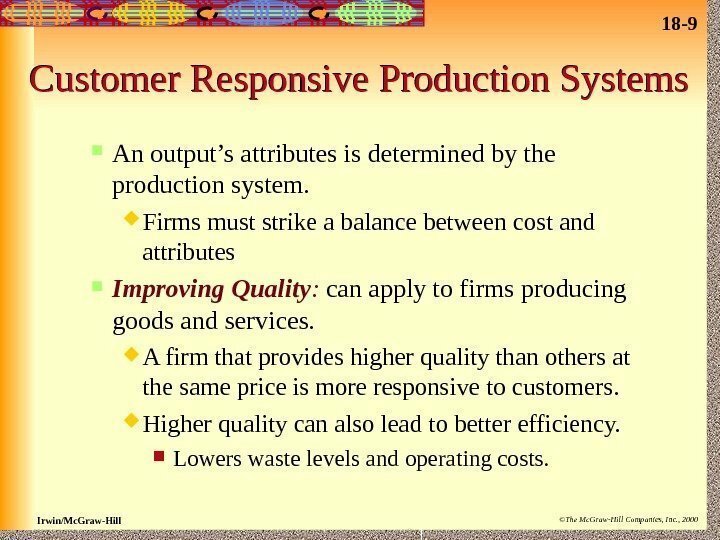 Graw-Hill Companies, Inc. , 2000 Customer Responsive Production Systems An output’s attributes is determined by the production system. Firms must strike a balance between cost and attributes Improving Quality : can apply to firms producing goods and services. A firm that provides higher quality than others at the same price is more responsive to customers. Higher quality can also lead to better efficiency. Lowers waste levels and operating costs. 18 — 10 Irwin/Mc. Graw-Hill ©The Mc. 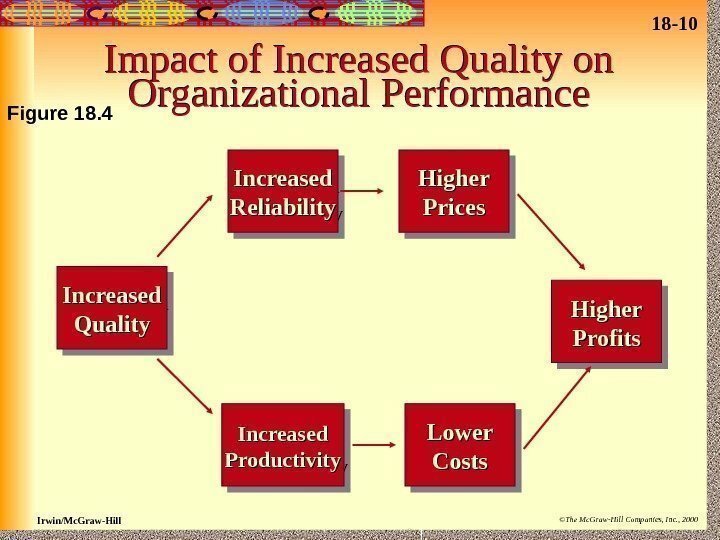 Graw-Hill Companies, Inc. , 2000 Impact of Increased Quality on Organizational Performance Increased Quality Increased Reliability Higher Prices Increased Productivity Lower Costs Higher Profits. Figure 18. 18 — 11 Irwin/Mc. Graw-Hill ©The Mc. Graw-Hill Companies, Inc. , 2000 Total Quality Management Seeks improvement in the quality of a firm’s goods or services. Stress that all activities be directed to this goal. 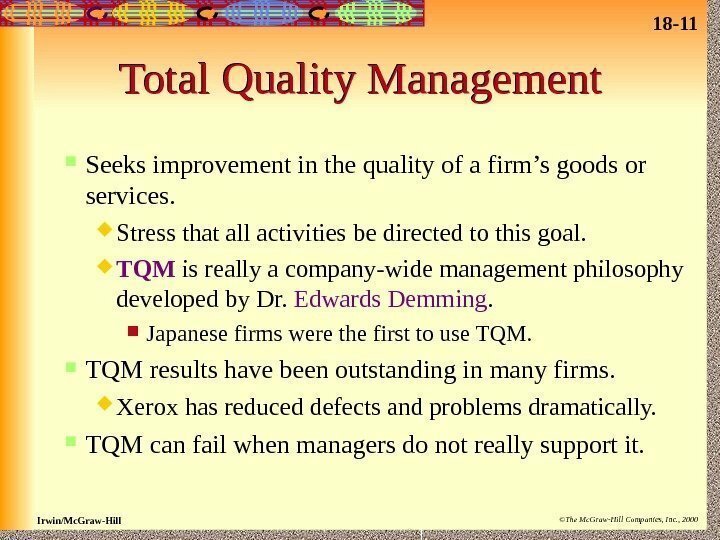 TQM is really a company-wide management philosophy developed by Dr. Edwards Demming. Japanese firms were the first to use TQM results have been outstanding in many firms. Xerox has reduced defects and problems dramatically. TQM can fail when managers do not really support it. 18 — 12 Irwin/Mc. Graw-Hill ©The Mc. 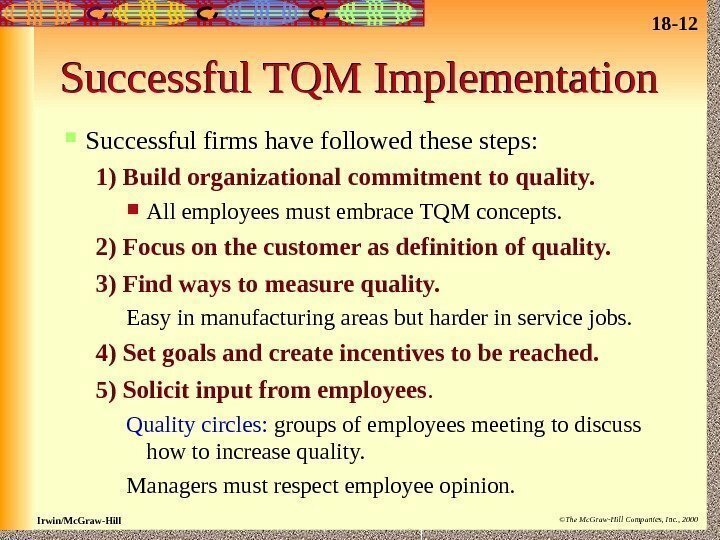 Graw-Hill Companies, Inc. , 2000 Successful TQM Implementation Successful firms have followed these steps: 1) Build organizational commitment to quality. All employees must embrace TQM concepts. 2) Focus on the customer as definition of quality. 3) Find ways to measure quality. Easy in manufacturing areas but harder in service jobs. 4) Set goals and create incentives to be reached. 5) Solicit input from employees. Quality circles: groups of employees meeting to discuss how to increase quality. Managers must respect employee opinion. 18 — 13 Irwin/Mc. Graw-Hill ©The Mc. 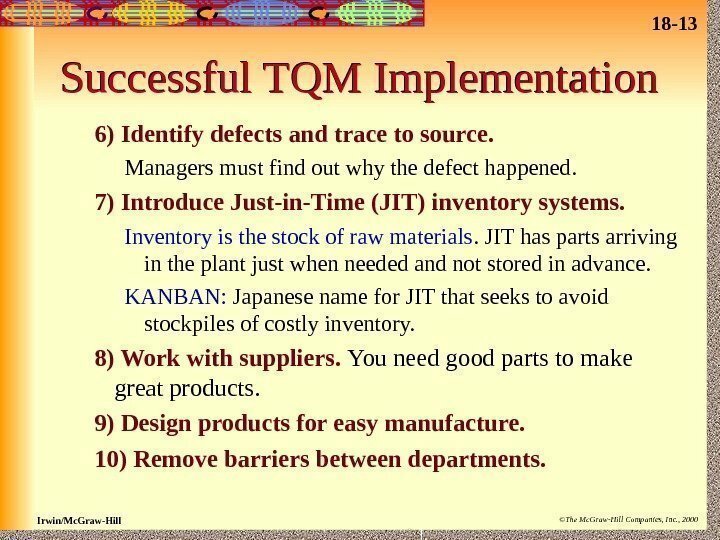 Graw-Hill Companies, Inc. , 2000 Successful TQM Implementation 6) Identify defects and trace to source. Managers must find out why the defect happened. 7) Introduce Just-in-Time (JIT) inventory systems. Inventory is the stock of raw materials. JIT has parts arriving in the plant just when needed and not stored in advance. KANBAN: Japanese name for JIT that seeks to avoid stockpiles of costly inventory. 8) Work with suppliers. You need good parts to make great products. 9) Design products for easy manufacture. 10) Remove barriers between departments. 18 — 14 Irwin/Mc. Graw-Hill ©The Mc. 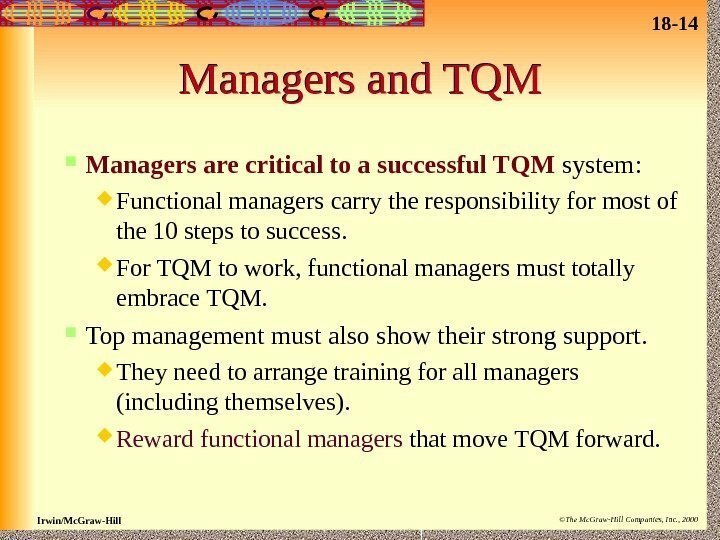 Graw-Hill Companies, Inc. , 2000 Managers and TQM Managers are critical to a successful TQM system: Functional managers carry the responsibility for most of the 10 steps to success. For TQM to work, functional managers must totally embrace TQM. Top management must also show their strong support. They need to arrange training for all managers (including themselves). Reward functional managers that move TQM forward. 18 — 16 Irwin/Mc. Graw-Hill ©The Mc. Graw-Hill Companies, Inc. , 2000 Improving Efficiency Labor productivity allows labor comparisons between organizations. Improved efficiency leads to lower costs and better performance. 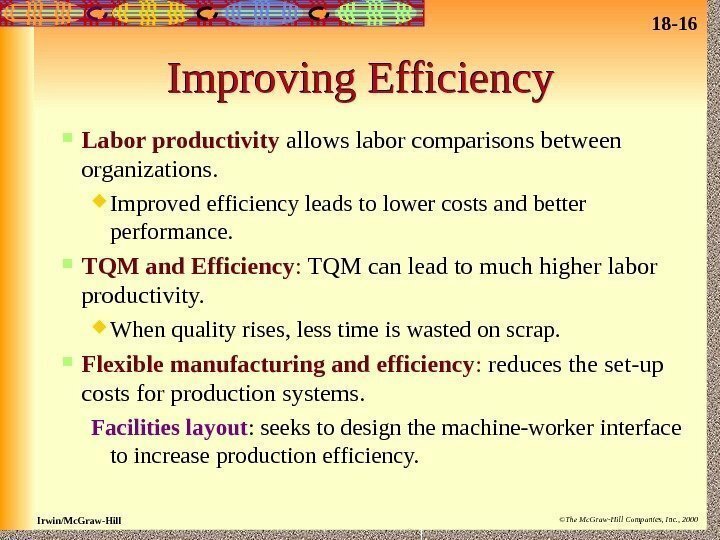 TQM and Efficiency : TQM can lead to much higher labor productivity. When quality rises, less time is wasted on scrap. Flexible manufacturing and efficiency : reduces the set-up costs for production systems. 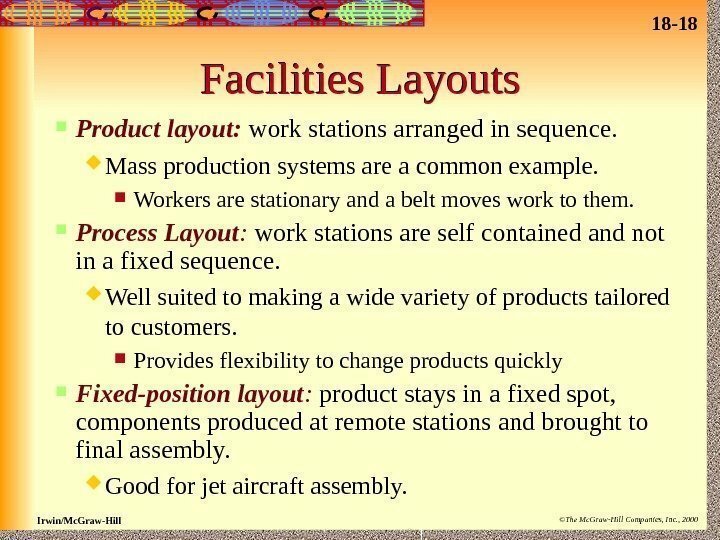 Facilities layout : seeks to design the machine-worker interface to increase production efficiency. 18 — 17 Irwin/Mc. Graw-Hill ©The Mc. Graw-Hill Companies, Inc. , 2000 Facilities Layouts Final Product layout Process layout Fixed- position layout. Figure 18. 18 — 18 Irwin/Mc. Graw-Hill ©The Mc. Graw-Hill Companies, Inc. , 2000 Facilities Layouts Product layout: work stations arranged in sequence. Mass production systems are a common example. Workers are stationary and a belt moves work to them. 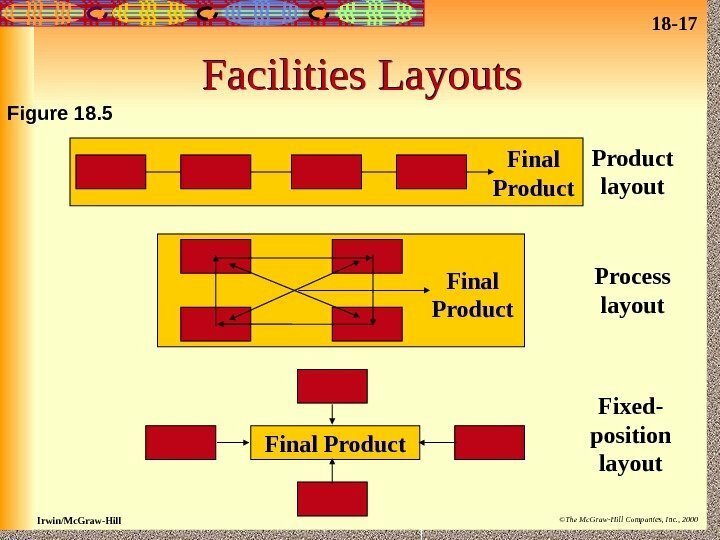 Process Layout : work stations are self contained and not in a fixed sequence. Well suited to making a wide variety of products tailored to customers. Provides flexibility to change products quickly Fixed-position layout : product stays in a fixed spot, components produced at remote stations and brought to final assembly. Good for jet aircraft assembly. 18 — 19 Irwin/Mc. Graw-Hill ©The Mc. Graw-Hill Companies, Inc. , 2000 Efficient Manufacturing Most firms face major expense when setting up to produce a product. These costs must be paid before production begins. The more often products to be built change, the higher setup costs become. 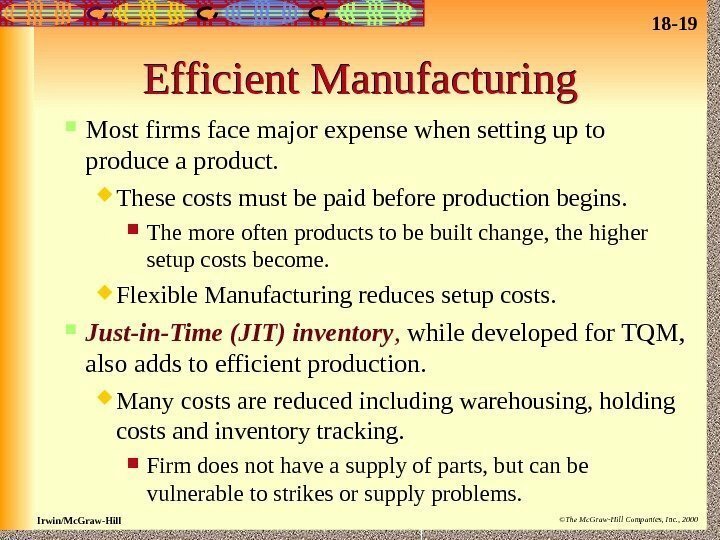 Flexible Manufacturing reduces setup costs. Just-in-Time (JIT) inventory , while developed for TQM, also adds to efficient production. Many costs are reduced including warehousing, holding costs and inventory tracking. Firm does not have a supply of parts, but can be vulnerable to strikes or supply problems. 18 — 20 Irwin/Mc. Graw-Hill ©The Mc. Graw-Hill Companies, Inc. , 2000 Efficient Manufacturing Self-managed teams boost efficiency by allowing for a flatter organization structure. The team takes the role of the supervisor. Teams working together often become very skilled at enhancing productivity. 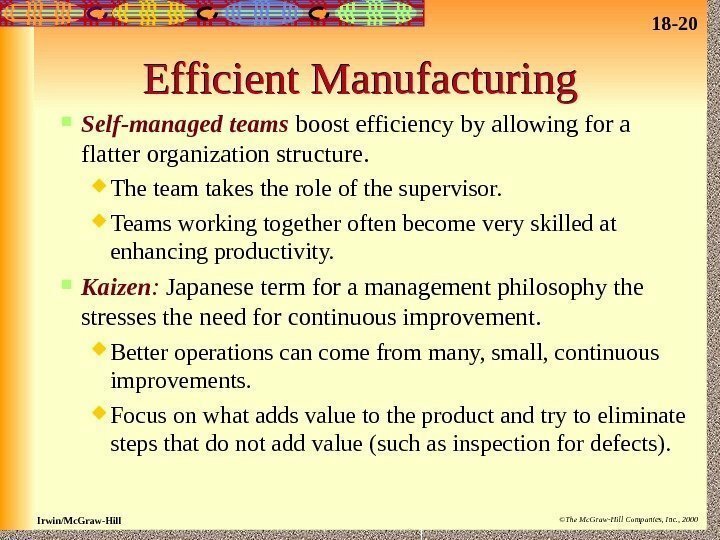 Kaizen : Japanese term for a management philosophy the stresses the need for continuous improvement. Better operations can come from many, small, continuous improvements. Focus on what adds value to the product and try to eliminate steps that do not add value (such as inspection for defects). 18 — 21 Irwin/Mc. Graw-Hill ©The Mc. Graw-Hill Companies, Inc. , 2000 Reengineering Process Reengineering : the fundamental rethinking and radical redesign of the business process. Can boost efficiency by directing efforts to activities that add value to the good or service produced. 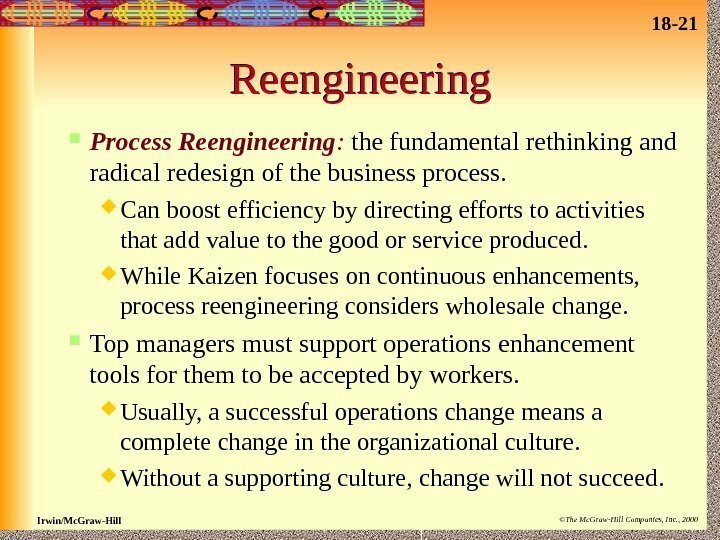 While Kaizen focuses on continuous enhancements, process reengineering considers wholesale change. Top managers must support operations enhancement tools for them to be accepted by workers. Usually, a successful operations change means a complete change in the organizational culture. Without a supporting culture, change will not succeed.